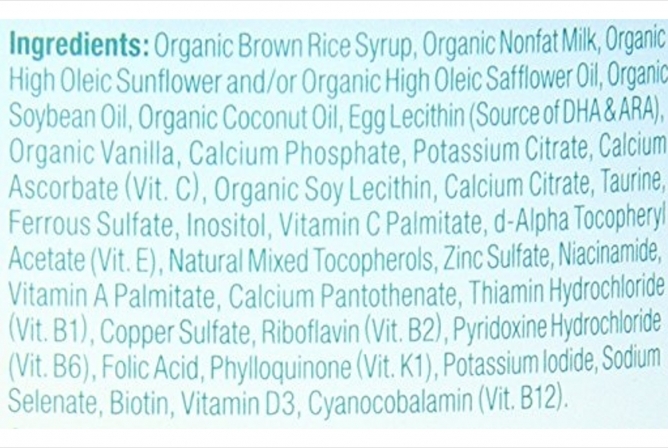 Baby’s Only Organic Dairy Formula has some of the best organic ingredients on the formula market. They stay true to the strict standards of organic regulations and don’t take any shortcuts to save money or time for their customers. Baby’s Only Organic Dairy Formula is a great option for any family to try with their little ones. No formula will ever be perfect, but Nature’s Only strives to produce formulas that meet their own high standards and the high standards of families with precious little babies to raise. Baby’s Only Organic Dairy Formula has some of the best organic ingredients on the formula market, staying true to the strict standards of organic regulations. Nature’s Only was founded in 1997 and is the leader in organic medical nutrition, especially when it comes to baby formulas. Their leading formula Baby’s Only Organic Dairy Formula, truly complies with strict organic regulations and doesn’t jump through any loopholes to save time or money. They stay true to organic integrity by upholding their “Pure 10 Pledge” to their customers. Their leading formula truly complies with strict organic regulations and doesn’t jump through any loopholes to save time or money. The reason Nature’s One has added “Toddler Formula” to their packaging is because they believe that breast milk is the best first option, and only want formula to be used as a last resort, thus making it a marketing push. However, this formula is safe for infants AND toddlers and provides the correct nutrition for newborns up until twelve months of age. DHA and ARA are two types of fatty acids that are found in breastmilk, resulting in many formula companies try to mimic this combination of fatty acids. However, the extraction method that is used to acquire these fatty acids is something that has concerned parents for some time. There is a chemical called hexane that is used in the extraction method of DHA and ARA, and it can be toxic to humans. A huge plus is that it has changed their healthy oil source and now uses a hexane-free DHA and ARA oil made from egg yolks. 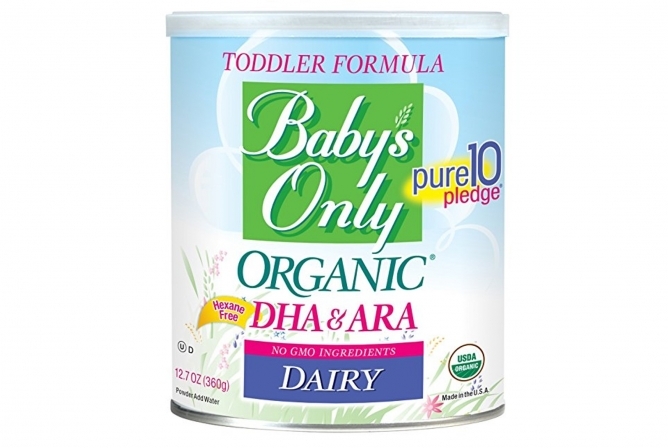 A huge plus for Baby’s Only Organic Dairy Formula is that it has changed their healthy oil source and now uses a hexane-free DHA and ARA oil made from egg yolks. The only downside to this method is that babies who are allergic to eggs or fish can’t use this formula. No formula is perfect, so Baby’s Only Organic Dairy Formula does have a few downsides. One of the biggest concerns that parents have is the use of brown rice syrup as a sweetener. Although Nature’s One markets this as the best option for added sweetness, brown rice syrup is still an artificial sweetener. It can cause an upset tummy, constipation, and is not naturally occurring in breast milk. One of the biggest concerns that parents have is the use of brown rice syrup as a sweetener. Another downside to Baby’s Only Organic Dairy Formula is that it is casein-dominant, much like cow’s milk instead of human milk, with a whey to casein ratio of 18:82. Whey and casein are two of the main proteins found in any kind of milk. Whey is very easy to digest and is digested much faster than casein, which sits in the stomach for a longer period of time. Casein can also cause constipation, one complaint that parents have of this formula. Again, the whole idea behind finding the best formula is to find one that mimics breast milk, and breast milk is whey dominant. In early human lactation, the whey to casein ratio is about 90:10 percent, followed by 60:40 percent in mature milk, and about 50:50 in late lactation. However, Nature’s One does have a better option, that is newer on their market, that has protein ratio that more closely mimics breast milk. This formula is called Baby’s Only Organic Formula with Whey and has a higher whey to casein ratio that is closer to breast milk. It also contains lactose as the only sweetener, which is the best option when it comes to added sweeteners. Of course, because of better ingredients, the price is higher. Another new product by Nature’s One that is debuting in 2017 is their Organic Formula with Whey with added DHA and ARA. Many parents are happy that Baby’s Only Organic Dairy Formula doesn’t have a smell to it. Their babies also really enjoy the taste and spit up doesn’t have a strong metal or fishy smell like other formulas. Nature’s One does a great job in making sure the best ingredients are used which makes sure there aren’t any unnatural strong tastes or smells! The majority of parents state that their babies tolerate Baby’s Only Organic Dairy Formula very well. This formula has even helped some babies reduce their colic, skin problems, and other minor ailments that can be linked to formula. However, there is a fair amount of people that say that Baby’s Only Organic Dairy Formula caused constipation in their little ones. This can be linked to both the high casein amounts in this formula, which don’t mimic breast milk and also the brown rice syrup. Casein digests slower in the stomach and can be hard for little babies to stomach. This, in turn, can cause constipation. 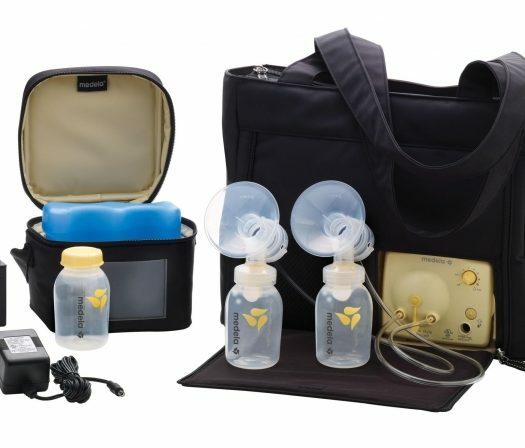 Breast milk has higher amounts of whey in it which is easier to digest and passes through the stomach at a faster rate. Brown rice syrup, on the other hand, is also hard to digest for some babies. Unlike the primary sugar (lactose) in breast milk, brown rice syrup takes longer to pass through the digestive system and is harder for a baby’s stomach to break down during digestion. These two things can be linked to slowing down a baby’s delicate digestive system, in turn causing constipation. Again, some babies won’t have a problem while others won’t tolerate it well. Every baby is very different! 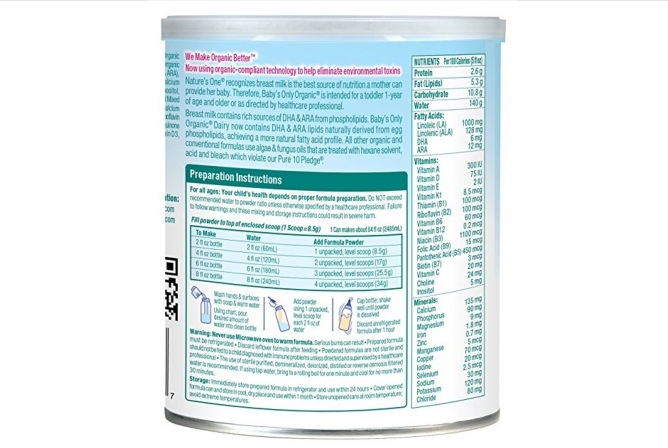 Baby’s Only Organic Dairy Formula can be used from day one of baby’s life. The packaging states that this is a “Toddler Formula” when this is really a marketing move to promote the use of breast milk if at all possible. Still, many parents are unable to use breast milk and don’t want to play marketing games to figure out if formulas are safe for their little ones. So because this formula can be used from day one until well into toddler years without having to worry about different stages of formula, it has great potential to be used for many years to ensure the health of your babes. As for how long this formula will last, it comes in a 12.7 ounce can, which is a pretty standard size that most baby formulas come in. It will probably last a few days, maybe even less if you have a hefty eater on your hands. Price for Baby’s Only Organic Dairy Formula is very reasonable considering its high standards for the organic ingredients included. However, the price may be lower because of the lack of more quality ingredients like whey protein and lactose, both of which are more expensive to use in formulas but are naturally found in breast milk in high amounts. 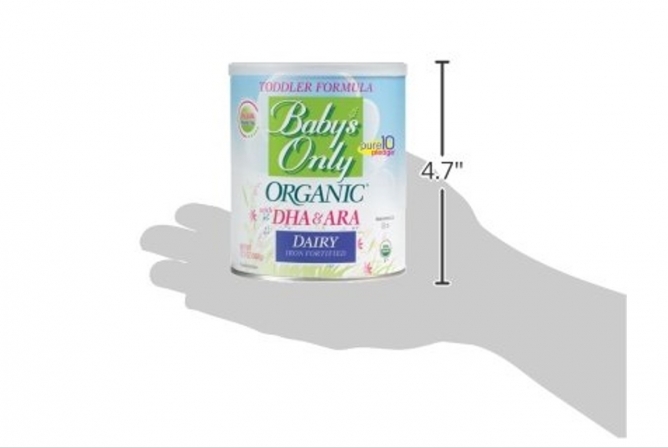 When looking at the full MSRP for Baby’s Only Organic Dairy Formula, it sits at $16.99 for a 12.7 ounce can. The price per ounce comes out at about $1.33/oz, which is higher than a few other formulas we’ve reviewed. This is a great price for high-quality organic ingredients. Baby’s Only Organic Dairy Formula has some of the best organic ingredients on the formula market. They stay true to the strict standards of organic regulations and don’t take any shortcuts to save money or time for their customers. Nature’s Only does set high expectations for their products and aims to meet and exceed those expectations. The only downsides to Baby’s Only Organic Dairy Formula are the use of brown rice syrup as a sweetener and the high amounts of casein. Both of these ingredients can sometimes cause constipation in some babies, but other babies might tolerate them well. Still, the true aim of any formula should be to mimic breast milk in any way possible, and this formula falls short in this category. In the end, Baby’s Only Organic Dairy Formula is a great option for any family to try with their little ones. Nature’s Only uses only high-quality organic ingredients, a standard that many companies don’t care about when it comes to USA-made formulas. Nature’s Only gets major points for making formulas that have ingredients held to high standards. No formula will ever be perfect, but Nature’s Only strives to produce formulas that meet their own high standards and the high standards of families with precious little babies to raise.